Senate Minority Leader Mitch McConnell’s re-election battle against a credible conservative opponent upends congressional politics in a way that makes it harder to avoid a government shutdown and debt default. In recent years, the Kentucky Republican has had a knack for cutting deals at the last minute to break impasses and avert fiscal crises. This time around — as federal government funding expires Sept. 30 and as the U.S. brushes up against the debt limit in the fall — playing that role could end his career. “I’ve watched McConnell closely and after the fiscal cliff resolution he’s taken on a very different role, including last week sabotaging Susan Collins on the transportation bill. He’s very fearful of a challenger to his renomination,” said Norm Ornstein, a scholar at the conservative American Enterprise Institute. “And stepping in at the last minute to do a budget deal or save us from breaching the debt limit would be disastrous for him.”Senate Democratic leaders also worry that his re-election dynamics make crisis likelier, especially with Speaker John Boehner (R-OH) more powerless than usual, having promised his ultraconservative members he won’t negotiate privately with President Obama. 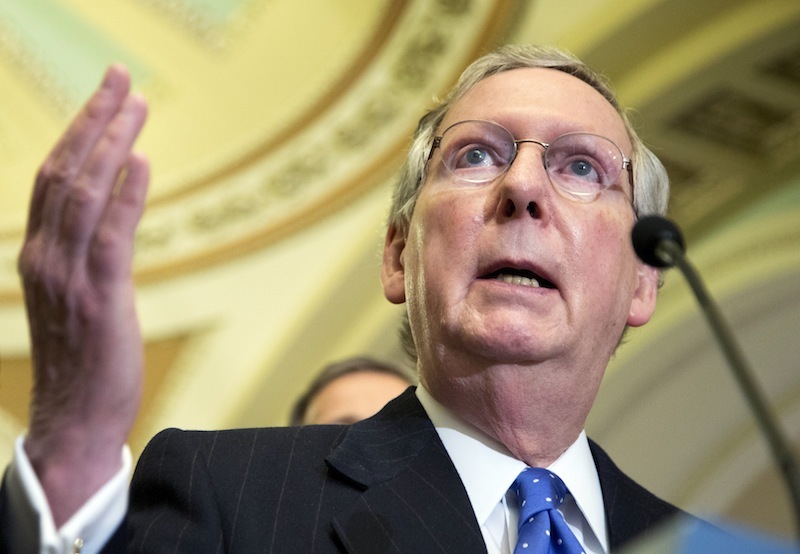 In the final hours of 2012, McConnell negotiated a resolution to avoid tax hikes as part of the so-called fiscal cliff. At the end of 2011, he negotiated the agreement to extend the payroll tax cut and unemployment benefits. And earlier that year the White House relied on him to iron out a deal to avert a catastrophic default with just two days to spare. Conservatives fought against all of those deals, demanding deeper spending cuts and zero tax hikes every step of the way. McConnell wasn’t running for re-election then, but he is now. A McConnell campaign spokesman didn’t return a request for comment. Asked last Thursday in the Capitol if his tea party primary challenge from Matt Bevin motivated his decision to whip members to block a government funding bill, McConnell laughed, and defended his move on the merits. “The reason for this vote — and by the way all but one Republican voted the way I suggested — was because we need to indicate we’re going to keep our word around here” with regard to spending cuts in the 2011 debt limit agreement, he said. Bevin is already attacking McConnell for not being confrontational enough in forcing a shutdown if Obamacare isn’t defunded. So far Bevin has won the endorsement of at least one conservative group, the Madison Project, and others like the Club For Growth are neutral for now but demanding McConnell be more forceful in pushing to defund Obamacare. Despite his lack of political experience, Bevin poses a real threat to the unpopular incumbent in a bright red state won by ultraconservative novice Rand Paul in 2010 against McConnell’s preferred candidate. And that’ll not only mean avoiding the appearance of forging compromises that conservatives dislike (which in reality means cutting any deal, period). It could also compel him to use the muscle of the Senate minority to block a deal. McConnell’s other challenge is that President Obama can hurt him simply by praising him.